Mango season is just about over. This is one of the ways we were enjoying them this summer. They never lasted long so it was always difficult to get a picture of them. Bilal has been loving smoothies this summer. It all started with the Green Monster. They are a great way to get him to have some extra fruit. I love the citrus flavour that the orange juice brings. I find these smoothies are best if had immediately. They thicken up while sitting in the fridge. Put all ingredients in a blender and puree. I don't have a blender so I put everything in a jug and use my immersion blender to puree it. Very delicious & yummy smoothie !! This looks just delicious! Visiting from Foodtastic Friday! I just need a couple ingredients and I can make this! sounds so good. 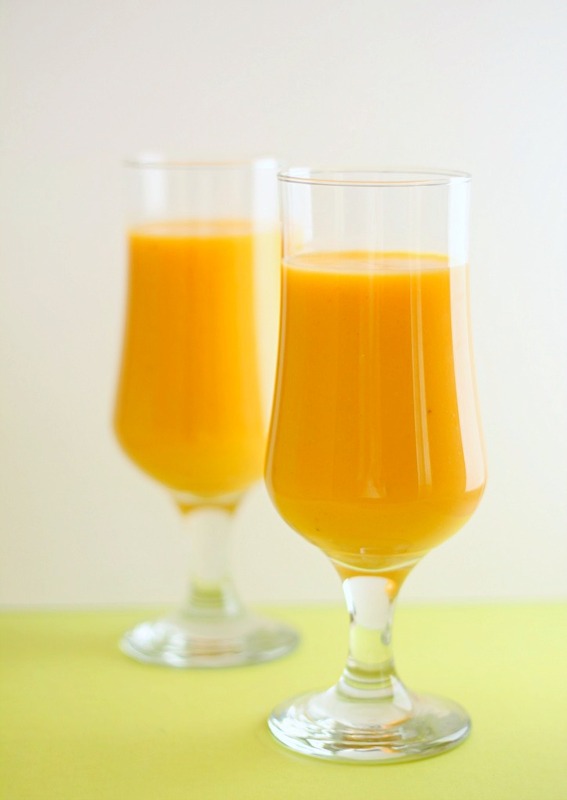 Mango juice is so delicious and what a gorgeous photo! Wow, my mouth is watering right now. I love everything mango. Your smoothie recipe sounds delicious! Plus super healthy with all the fruits included. Thanks for sharing Asiya! I've been trying to leave you comments for quite some time now but for some reason I'm not able to. I tried with the ricekrispie post as well. Really....did you get an error message? I've been getting comments so I don't know of anything not working. Glad it's working now! If you have problems again you can email me chocnchillies@gmail.com. I looove mangoes + this smoothie looks absolutely delicious. YUM! Thank you for linking up to Tasty Thursday.